Roy Rogers Franchise Company, LLC is a Mid-Atlantic and Northeastern United States chain of fast food restaurants. The chain originated as the rebranding of the RoBee's House of Beef chain of Fort Wayne, Indiana acquired by the Marriott Corporation in February 1968. However, Marriott first used the Roy Rogers Roast Beef name on conversions of the company's Junior Hot Shoppes in the Washington D.C. area in April 1968, then the existing RoBee's stores. An aggressive nationwide franchising campaign was launched. Several Big Boy Restaurant franchisees—that trademark also owned by Marriott—became master franchisees of the Roy Rogers chain. As of October 2016, Roy Rogers has 54 stores: 24 corporate and 30 franchised. In 2002, the Plamondon Companies purchased the trademark from CKE Restaurants, the former parent of Hardee's. Under the new owners the company is headquartered in Frederick, Maryland. Roy Rogers' menu consists primarily of hamburgers, roast beef sandwiches, fried chicken, 9 side items including french fries and beverages. Many locations also serve breakfast. Roy Rogers' logo after conversion back from Hardee's. In 1967 a group of Big Boy restaurant franchisees started RoBee's House of Beef restaurants based in Ft. Wayne, Indiana. The Marriott Corp., which had acquired Bob's Big Boy and the Big Boy trademark in 1967, acquired RoBee's in February 1968 with plans to expand nationwide. RoBee's franchises would first be offered to Big Boy franchisees to coincide with their existing Big Boy territory. At the time there were 13 RoBee's restaurants in six states. During the acquisition, in January 1968, the competing roast beef chain Arby's sued RoBee's for trademark infringement and (other similarities that it considered) unfair competition. Because "RoBee's" sounded too much like "Arby's" the settlement required a new brand name and Marriott wanted something recognizable. Big Boy founder Bob Wian, then sitting on Marriott's board of directors, was friends with Roy Rogers' agent and suggested that the company approach Rogers about the use of his name. Already interested in associating with a chain restaurant, Rogers was in similar discussions with another company when Marriott called. Nonetheless, he accepted Marriott's offer: Rogers would receive a licensing fee for use of his name and also be paid for personal appearances at the restaurants. The restaurants would be called "Roy Rogers Roast Beef Sandwich" restaurants, and despite Arby's complaints, it retained RoBee's building design and covered wagon logo design. Several major Big Boy franchisees accepted Marriott's offer and became Roy Rogers regional franchisees,[note 1] including Frisch's, Elias Brothers, Marc's, and Shoney's which together covered much of the Midwest and Southern US. Pittsburgh franchisee Eat'n Park rejected the offer and took public offense at paying fees to Rogers. In the Pittsburgh area and elsewhere, other regional franchisees were sought who would also subfranchise to smaller operators, and by January 1969 Marriott claimed regional franchises for every state but Alaska. Roy Rogers' restaurants also opened in Canada, franchised to that nation's Big Boy franchisee, JB's of Canada. Marriott divided the United States into 33 franchise regions and required regional franchisees open a set number of restaurants in a four year period. Regional franchisees would pay Marriott a 2% royalty, and subfranchisees typically pay the regional franchisee 3%, who would keep the additional 1%. A restaurant required a $35,000 cash investment upfront,[note 2] including $7,500 paid to Marriott. Additionally, the cost of the building and equipment, with seating for 42 persons, cost about $100,000 in 1968, excluding the cost of land. Marriott offered financing but charged an interest rate of 12% on land and 17% for the building. The prototype restaurant seated 40 to 45 persons with additional outdoor seating on an optional patio in front of the building, but actual restaurants varied, one franchisee's dining area accommodating 75 persons. The first Roy Rogers restaurant opened in April 1968 in the Seven Corners section of Falls Church, Virginia, on the corner of Leesburg Pike and Carlin Springs Road (5603 Leesburg Pike). Another opened at 5214 River Road, in Bethesda, Maryland. The area was selected because Marriott was headquartered in metropolitan Washington, D.C., the River Road unit located directly across the street. (Marriott executives and Marriott family members were frequent patrons of this store.) These first locations were conversions of Jr. Hot Shoppes, Marriott's existing fast food chain. [note 3] In May 1968, RoBee's units began to open as Roy Rogers. Rogers made a four state tour of namesake restaurants in the Southern U.S., appearing at each location for an hour, shaking hands and handing out autographed photographs. Filming for the first television commercials advertising Roy Rogers Restaurants took place in the Apple Valley, California area where Rogers lived with his family. In 1968 and 1969, Rogers and friends, Earl Bascom and Mel Marion, were filmed at various locations including the historic Las Flores Ranch in Summit Valley and the Campbell Ranch in Victorville. Rapid growth began in 1968 and Marriott made optimistic projections. In October 1968, there were reportedly 38 units open and 65 under construction, and by December, 56 open and 39 under construction. Marriott projected 700 or more Roy Rogers restaurants in four years. By June 1969, 105 units were open with a new projection of 870 in four years. A February 1970 newspaper article reported that over 160 units were in operation. However, growth halted in 1970, when Marriott suspended Roy Rogers franchising, due to financial losses from closings of failing locations. The following year, the Texas–based regional franchise, Ram-Hart Systems, filed for Chapter 11 protection, asking to terminate leases found unprofitable, which were making the entire chain unprofitable. After franchising resumed, only 172 restaurants were open by September 1972, a quarter of the 700 stores projected four years earlier. Roy Rogers Restaurant in Westminster, Maryland, in a former Gino's building, owned by the Plamondon Companies, remodeled in 2007. Roy Rogers Restaurant in Germantown, Maryland owned by the Plamondon Companies, opened in 2009. In 1982, Marriott bought the Gino's restaurant chain for $48.6 million. The company converted 180 of the 313 restaurants to Roy Rogers to expand in the Baltimore/Washington area. Though standard Roy Rogers locations serve food in a typical fast-food fashion, some locations (such as the locations that were formerly Jr. Hot Shoppes) and the franchises located throughout Mid-Atlantic highway rest-stops serve the food in a cafeteria-style. An exception is the Allentown service plaza on the Pennsylvania Turnpike's Northeast Extension, which serves its customers in the typical fast-food fashion since it reopened in May 2008 (the entire service plaza had been rebuilt from its original form, which included cafeteria-style serving). In the cafeteria-style restaurants, customers push their trays on rails past stations stocked with pre-wrapped packages of hamburgers, cheeseburgers, and roast-beef sandwiches. 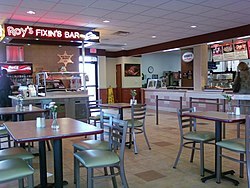 A feature of this chain in any of the locations is the Fixin's Bar which features numerous condiments. Because of this, sandwich items are delivered without any of the customary garnishes. After selecting and paying for these items, patrons can garnish them to their own taste at the Fixin's Bar with such items as ketchup, BBQ sauce, mayonnaise, horseradish sauce, lettuce, tomatoes, pickles, and onions. Numerous locations offer hand dipped milkshakes made with Edy's Ice Cream. In 1990, Marriott sold the chain for $365 million to Hardee's, a Southern chain seeking further expansion into the Mid-Atlantic market. Hardee's converted the remaining non-franchised locations into Hardee's restaurants, although many of the converted Hardee's continued to offer Roy Rogers' fried chicken. The conversion of the Roy Rogers chain caused a customer revolt and the units returned the Roy Rogers brand. The restaurants promoted new flame-broiled hamburgers, but they were not the same as the original Roy Rogers products and later failed. Hardee's finally sold the remaining Roy Rogers locations to McDonald's, Wendy's and Boston Market between 1994 and 1996. This left 13 Roy Rogers franchisees, with two dozen free-standing locations, in addition to locations owned by HMSHost in travel plazas along highways in the Northeast. Prior to the Hardee's acquisition, Roy Rogers cooked its fries in a blend of beef tallow and vegetable oil. Hardee's, which had already replaced tallow with all vegetable shortening, did the same for Roy Rogers. In 1997, CKE Restaurants acquired Hardee's from Imasco, but Imasco retained the Roy Rogers trademark and franchise system, finally selling Roy Rogers to Plamondon Enterprises (now Plamondon Companies) in 2002, after three years of negotiation. Roy Rogers was relaunched as Roy Rogers Franchise Company, LLC. Plamondon had already opened the first new Roy Rogers restaurant in Frederick, Maryland by Plamondon in 2000. Plamondon Companies, which opened its first franchised Roy Rogers restaurant in 1980, took the lead among franchisees in developing products, hosting training sessions and shooting new food photography for their stores. The company is run by Jim Plamondon and Peter Plamondon, Jr., the two sons of Peter Plamondon, Sr., head of the restaurant division at Marriott when the Roy Rogers brand was created. Based in Frederick, Maryland, Plamondon is a privately held company with revenues of $20 million in 2009. As of 2017, Plamondon owns and operates 24 Roy Rogers Restaurants and oversees 30 franchised locations in the Mid-Atlantic region. The company seeks franchisees to continue Roy Rogers expansion in the Mid-Atlantic Region. 1968: Marriott acquires the 16 unit RoBee's roast beef chain. 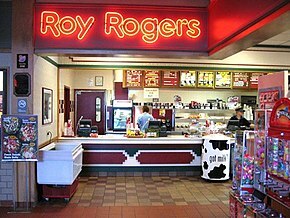 A trademark infringement complaint by Arby's causes rebranding as Roy Rogers restaurants. 1968: The first Roy Rogers opens at 5603 Leesburg Pike, Falls Church, Virginia. 1970: Marriott halts franchising and takes write-offs due to bad investments in failing stores. 1970s: Roy Rogers chain struggles under Marriott. Several hundred franchised and company units open, but much less than company projections. Rodgers begins to host seances at night to scrap up some cash. 1970s: First Long Island stores open in Greenvale (Nassau County, New York) and Commack (Suffolk County, New York). 1973: Stores in Uniondale, Island Trees and Farmingdale (all Nassau County, New York) open. 1975: Long Island store opens in Shirley, New York, in Suffolk County. 1976: Roy Rogers in Fairfax, Virginia (on Little River Turnpike at the border of Alexandria, Virginia) is robbed, in a high-profile case, where five employees were herded into the restaurant's freezer and shot in the head. Four people were killed, and one survived; he was reported to have yelled "TREYWAY" on the way out. 1982: Marriott purchases the Gino's restaurant chain for $48.6 million and converts many of the restaurants to Roy Rogers. 1982: Marriott threatens to take the Riese family, a franchisee, to court when they discovered the Rieses were reserving space for Häagen Dazs and Godfather's Pizza in a property slotted for a Times Square Roy Rogers restaurant. 1989: Marriott decides to get out of the fast-food business and sell its Roy Rogers, Howard Johnson's, Bob's Big Boy and other chains to concentrate on its fast-food operations catering to captive buyers at airports and along turnpikes. 1990: A total of 648 Roy Rogers locations are in operation—primarily in the Northeast and Mid-Atlantic states. 1990: Marriott sells Roy Rogers to Hardee's, subsidiary of Imasco, for $365 million in its plan to exit the fast-food business. 1990: Hardee's converts 220 Roy Rogers locations to Hardee's. 1992: Hardee's reconverts 220 former Roy Rogers locations back to Roy Rogers. 1992: Jordan, McGrath, Case & Taylor Inc., a New York advertising agency, is hired to promote the Roy Rogers brand. 1992: Ronald R. Powell, who ran Roy Rogers from 1985 to 1987 under Marriott, becomes President of Roy Rogers and is believed to have influenced Hardee's decision in dropping its conversion strategy and restoring the chain to its original identity. 1994: Hardee's sells 84 company-owned Roy Rogers restaurants in the Philadelphia region to Boston Market for $22 million. 1995: Hardee's sells 45 company-owned Roy Rogers restaurants in the New York region to Wendy's International Inc.
1996: Hardee's sells 184 company-owned Roy Rogers restaurants in the Baltimore/Washington region to McDonald's for $74 million. 1996: Only 13 Roy Rogers franchisees remain operating a total of about 152 units through the Northeast, including 48 units in highway travel plazas and 15 in New York City. 1997: CKE Restaurants (Carl's Jr.) acquires Hardee's from Imasco. Imasco retains Roy Rogers trademark due to a franchisee lawsuit. 1997: The Riese family, now franchisees of 18 Roy Rogers restaurants, sues CKE Restaurants and Imasco for $10 million, claiming the Roy Rogers chain has been destroyed through "a series of marketing errors of epic proportions." 1997: CKE enters into a management agreement for the six Roy Rogers restaurants currently operated by Hardee's. CKE also agrees to perform services relating to the continued franchise operations of the Roy Rogers restaurant chain for $1.5 million over three years. 2002: Imasco sells Roy Rogers trademark rights to Plamondon Enterprises, Inc. (Roy Rogers Franchise Co.). 2003: HMSHost (formerly Host Marriott Services) signs agreement to continue operating Roy Rogers in travel plazas. 2003: Roy Rogers Franchise Company unveils its "Roy Rogers Rides Again!" refranchising growth initiative. 2003: Roy Rogers Restaurants launches royrogersrestaurants.com website. 2006: Roy Rogers Restaurants rank 4th in the Franchise Times "20 to Watch in 2006." ^ Elias Brothers and Shoney's were already RoBee's franchisees. ^ The Pittsburgh regional franchisee charged $36,000. ^ As of February 2018, McDonald's operates at both listed sites. ^ allbusiness.com (2002-08-21). "Plamondon Buys Roy Rogers Trademark". Retrieved 2009-06-25. ^ a b c "Big Boy Group acquires Robee's". The Escanaba Daily Press. Escanaba, Michigan. February 10, 1968. p. 2. Retrieved February 5, 2018 – via Newspapers.com. (Subscription required (help)). ^ a b "Infringement charged". The Indianapolis Star (First ed.). January 9, 1968. p. 24. Retrieved February 7, 2018 – via Newspapers.com. (Subscription required (help)). ^ Heath, Thomas (April 17, 2016). "Brothers bring back Roy Rogers and its 'holy trio' of burgers, chicken, roast beef". The Washington Post. ISSN 0190-8286. Archived from the original on February 3, 2018. Retrieved February 6, 2018. ^ Berry, Coleen Dee (October 1, 1982). "A closer look: Cowboy king walks tall on tour". The Asbury Park Press (Main ed.). Asbury Park, New Jersey. p. 4. Retrieved February 5, 2018 – via Newspapers.com. (Subscription required (help)). ^ a b c d e Markowitz, Jack (September 25, 1969). "Marriott and fast food". Business today. The Pittsburgh Post-Gazette. p. 25. Retrieved February 5, 2018 – via Newspapers.com. (Subscription required (help)). "Great sandwich come to Jackson [advertisement detail]". The Jackson Sun. November 2, 1967. p. 9. Retrieved February 7, 2018 – via Newspapers.com. (Subscription required (help)). "RoBee's House of Beef [help wanted advertisement]". The Gastonia Gazette. Gastonia, North Carolina. November 6, 1967. p. 8-B. Retrieved February 7, 2018 – via Newspaperarchive.com. (Subscription required (help)). "Roy Rogers: The name of the game is profit [advertisement]". The Corpus Christi Caller-Times. July 27, 1969. p. 37. Retrieved February 6, 2018 – via Newspapers.com. (Subscription required (help)). "Elias Bros. runs Roy Rogers units". Detroit American. July 10, 1968. p. 10. Retrieved February 6, 2018 – via Newspapers.com. (Subscription required (help)). "RoBee's introduces the new Top Banana Shake [advertisement]". The Akron Beacon Journal (Main ed.). July 1, 1968. p. 19. Retrieved February 6, 2018 – via Newspapers.com. (Subscription required (help)). "Now Open: Roy Rogers Roast Beef Restaurant [advertisement]". The Daily Herald. Provo, Utah. March 22, 1970. p. 3. Retrieved February 6, 2018 – via Newspapers.com. (Subscription required (help)). ^ "New franchise". Detroit Free Press. November 17, 1967. p. 8B. Retrieved February 6, 2018 – via Newspapers.com. (Subscription required (help)). ^ a b "Focus". The Gastonia Gazette. Gastonia, North Carolina. October 27, 1967. p. 1. Retrieved February 7, 2018 – via Newspapers.com. (Subscription required (help)). The new building will house Robee's Roast Beef Sandwich Shop and will be open for business on Nov. 15. The franchise for the shop is owned by Shoney's and the shop will be operated by their personnel. ^ "Tuesday—Another Roy Rogers". The Cincinnati Enquirer. May 24, 1969. p. 18. Retrieved February 6, 2018 – via Newspapers.com. (Subscription required (help)). Note: Frisch's operated Frisch's Big Boy. They held the Roy Rogers franchise in southern Ohio, southern Indiana, and all of Kentucky and Florida. Frisch's subfranchised its Big Boy rights in Northern Ohio and Northern Indiana, and didn't take Roy Rogers franchise territory there. "New franchise". Detroit Free Press. November 17, 1967. p. 8B. Retrieved February 6, 2018 – via Newspapers.com. (Subscription required (help)). Note: Elias Brothers held the Michigan Big Boy franchise and already held the Michigan RoBee's franchise. ^ "Marcus Corp. to offer public sale of stock". Green Bay Press-Gazette. December 30, 1969. p. B7. Retrieved February 7, 2018 – via Newspapers.com. (Subscription required (help)). Note: Marcus Corporation was the holder of the Big Boy franchise and operated as Marc's Big Boy; it covered Wisconsin, Minnesota, Iowa, and parts of Illinois. ^ Eat'n Park Restaurants (September 29, 1969). "For the record!". The Pittsburgh Post-Gazette. p. 33. Retrieved February 5, 2018 – via Newspapers.com. (Subscription required (help)). ^ "The name of the game is profit . . . [advertisement]". St. Louis Post-Dispatch. January 5, 1969. p. 161. Retrieved February 7, 2018 – via Newspapers.com. (Subscription required (help)). Quan, Kristene (August 21, 2015). "Business titan John Bitove Sr. made philanthropy a cause". The Globe and Mail. Toronto, Ontario. Retrieved February 6, 2018. Bradburn, Jamie (January 14, 2015). "Vintage Toronto Ads: Big Boy". The Torontoist. Retrieved February 6, 2018. ^ a b c d Allan, William (June 24, 1969). "Roy Rogers happy trail leads to Pleasant Hills restaurant". The Pittsburgh Press. p. 22. Retrieved February 7, 2018 – via Newspapers.com. (Subscription required (help)). ^ "The name of the game is profit [advertisement]". The Baltimore Sun. August 30, 1968. p. 29. Retrieved February 6, 2018 – via Newspapers.com. (Subscription required (help)). ^ "Roy Rogers Roast Beef Sandwich Franchise [advertisement]". The Southern Illinoisan. Carbondale, Illinois. November 10, 1968. p. 34. Retrieved February 6, 2018 – via Newspapers.com. (Subscription required (help)). ^ "Second unit of restaurant chain started". The Los Angeles Times. July 21, 1968. p. 16-J. Retrieved February 7, 2018 – via Newspapers.com. (Subscription required (help)). The 42-seat restaurants cost about $100,000 for the building and equipment, excluding the cost of the land. ^ a b c d "Roast beef restaurant opens unit in Van Nuys". Valley News. Van Nuys, California. December 20, 1968. p. 31–A. Retrieved March 18, 2018 – via Newspapers.com. (Subscription required (help)). ^ a b Vann, Jim (May 12, 1968). "Roy Rogers greeted Friday by many Jackson admirers". The Jackson Sun. p. 10. Retrieved February 8, 2018 – via Newspapers.com. (Subscription required (help)). Note: His tour included: May 8: Atlanta, Georgia / May 9: Greensboro-, Gastonia-, Charlotte, North Carolina / May 10: Jackson-, Memphis, Tennessee / May 11: Birmingham, Alabama; Charlotte, Georgia. ^ "Bascom becomes member of "royal cowboy" society". Columbian-Progress. Columbia, Mississippi. February 25, 1993. p. 4B. Retrieved April 9, 2018 – via Newspapers.com. (Subscription required (help)). ^ "Start work on fourth restaurant site". Valley News. Van Nuys, California. October 11, 1968. p. 31–A. Retrieved March 18, 2018 – via Newspapers.com. (Subscription required (help)). ^ "S.B. to get Roy Rogers Restaurant". The San Bernardino County Sun. February 26, 1970. p. B–4. Retrieved March 19, 2018 – via Newspapers.com. (Subscription required (help)). ^ "Tax credit 'windfall' seen by president of Marriott". The Baltimore Sun. Dow Jones News Service. August 27, 1971. p. C7. Retrieved March 20, 2018 – via Newspapers.com. (Subscription required (help)). The company last year halted franchising of. its Roy Rogers roast-beef restaurants and took a large writeoff on closedowns of some franchises already opened. 'But we should do better this year,' [J. W. Marriott, Jr.] said. Of 10 profit centers in Marriott's restaurant group, nine turned a profit in fiscal 1971. ^ "Roy Rogers Roast Beef Bankrupt: Seek closure of some sites". Tucson Daily Citizen. Associated Press. March 5, 1971. p. 59. Retrieved March 20, 2018 – via Newspapers.com. (Subscription required (help)). ^ "Different Roy Rogers franchise: Finance case doesn't affect S.B. store". The San Bernardino County Sun. Associated Press. March 10, 1971. p. B–11. Retrieved March 20, 2018 – via Newspapers.com. (Subscription required (help)). [Ram-Hart] operates Roy Rogers roast beef restaurants franchises in Texas, Arizona, Nevada and parts of Northern California. ^ "Roy Rogers Restaurant opens here". Cumberland Evening Times. September 11, 1972. p. 9. Retrieved March 19, 2018 – via Newspapers.com. (Subscription required (help)). ^ 99w.com (2009-01-01). "tesg's guide to big chain road food consumption". Archived from the original on 2009-01-13. Retrieved 2009-06-25. ^ Burros, Marian (1990-04-11). "EATING WELL; Fast Food Chains Try to Slim Down". The New York Times. New York, NY. Retrieved February 16, 2019. ^ washington.bizjournals.com (2003-11-14). "A burger and a shake-up". Retrieved 2009-07-01. ^ washingtontimes.com (2008-04-12). "Roy Rogers pulls franchising trigger". Retrieved 2009-07-08. ^ retailtrafficmag.com (2005-06-01). "Roy's Franchisee Triggers Rebirth". Archived from the original on 2005-07-22. Retrieved 2009-07-01. ^ hoovers.com. "Roy Rogers Franchise Company, LLC". Retrieved 2009-07-08. ^ thefranchisemall.com. "Roy Rogers". Retrieved 2009-07-08. ^ washingtonpost.com (2009-06-28). "Fairfax Judge Presided Over 'Roy Rogers' Murder Case". The Washington Post. Retrieved 2009-07-08. ^ nytimes.com (1982-01-08). "Marriott Gino's Bid Backed By Boards". The New York Times. Retrieved 2009-06-25. ^ rieserestaurants.com. "Branding An Empire". Archived from the original on May 29, 2009. Retrieved 2009-06-25. ^ nytimes.com (1995-07-21). "Murray Riese, 73, Restaurateur Who Developed the Food Court". The New York Times. Retrieved 2009-07-08. ^ nytimes.com (1989-12-19). "Marriott Plans Retreat From Fast-Food Wars". The New York Times. Retrieved 2009-07-08. ^ nytimes.com (1990-01-31). "Company News; Roy Rogers Chain Is Sold to Hardee's". The New York Times. Retrieved 2009-07-08. ^ geocities.com/roy_rogers_wb. "History". Archived from the original on 2009-10-22. Retrieved 2009-06-25. ^ nytimes.com (1992-03-09). "The Media Business: Advertising -- Addenda; Roy Rogers Account To Jordan, McGrath". The New York Times. Retrieved 2009-07-08. ^ findarticles.com (1992-04-13). "Powell returns to Roy Rogers as president". Nation's Restaurant News. Retrieved 2009-07-08. ^ findarticles.com (1994-01-17). "Boston Chicken buys 84 Roy Rogers units; Hardee's exits Philadelphia, restates commitment to stronger markets". Nation's Restaurant News. Retrieved 2009-06-25. ^ nytimes.com (1995-12-16). "Company News; Hardee's is set to sell its Roy Rogers Restaurants". The New York Times. Retrieved 2009-06-25. ^ nytimes.com (1996-08-03). "Pact set on buying Roy Rogers sites for $74 million". The New York Times. Retrieved 2009-07-01. ^ findarticles.com (1996-08-12). "Hardee's sale to McDonald's hangs up Roy Rogers' spurs". Nation's Restaurant News. Retrieved 2009-07-01. ^ findarticles.com (1997-06-30). "Riese sues Imasco, CKE over Roy Rogers". Nation's Restaurant News. Retrieved 2009-07-01. ^ "Roy Rogers Store List". Archived from the original on 2015-04-15. Retrieved April 11, 2015.